A UNESCO World Heritage Site, the Batad Rice Terraces of Banaue, Ifugao Province is one of the most spectacular landscapes in the Philippines. These secluded amphitheater-like terraces were carved out of the mountains by the Ifugao tribes people hundreds of years ago without the aid of machinery, way before the Spanish colonization of the archipelago. An international backpacker’s destination, Batad Village is located more than 350 km north of Manila: ten hours by bus, one and a half hours by jeepney over rough road, and another hour on foot. 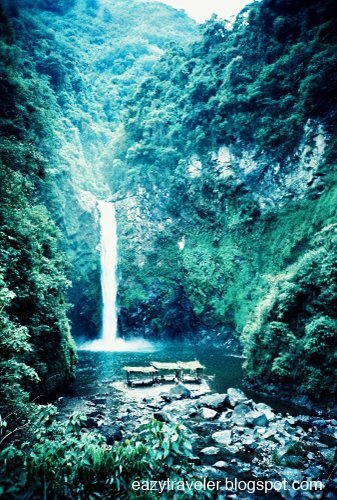 A 45-minute hike traversing the stairway of rice paddies will take you to the imposing Tappiyah Falls that thunders through a rocky gorge. During the pitch black of night, pockets of trees along the mountain slopes glow with the bioluminescence of fireflies, with a dozen of them waltzing their way into my room, attracted by incandescent lamps. Modernization is inevitably changing the landscape. Sadly, most Ifugao farmers in Batad prefer to roof over traditional huts with unsightly galvanized iron sheets instead of cogon grass, which has to be replaced every five years. Even worse, empty water bottles and trash are starting to litter the forest trails. Locals and tourists alike should help preserve this incomparable haven. Most alarmingly, the rice terraces of the Cordillera are threatened by landslides, destructive rats, erosion caused by invasive giant earthworms, and migration of native farmers who abandon their ancestors’ terraces and move to urbanized areas in pursuit of higher income. If these problems continue at the current rate, these 2,000 year-old landscapes will vanish in less than a decade. To get to Banaue from Manila, please see details here. 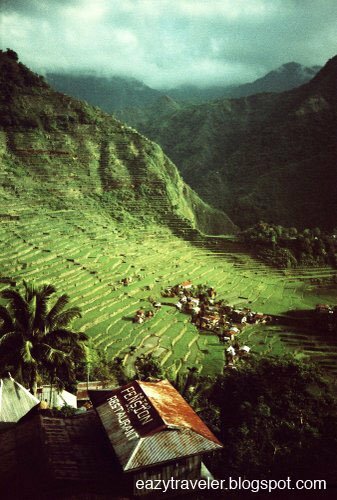 Take a jeepney (P150, 1.5 hours) at Banaue poblacion bound for Batad ‘saddle’, which sits on the rim of a steep bowl-shaped valley. For fantastic views of the rice terraces along Talop, Kinakin and other villages along the route, ride on top of the jeepney (at your own risk). From the ‘saddle’, it’s an hour’s hike downhill to sitio Chung Chung overlooking Batad Village. Upon arrival, you have to register at the Tourist Information Center at Chung Chung, where most of the accommodations are. I stayed at the very warm and friendly Hillside Inn (P150, Contact Maya at +639193799599 or +639057699796), a simple accommodation with a balcony view of the rice terraces. Continental and Filipino meals are served (P70-100). Tourist guides, for hikes to Tappiyah Falls and villages beyond, charge P1000/day. Darwin Poligon (+639083874692) is a reliable guide who took me on a 10-hour return hike to the hidden rice terraces of Cambulo and Pula, Tappiyah Falls and Batad Village. Although Ifugaos are very congenial, remember that photography is taboo for some superstitious individuals, most especially among elders. Many will be tolerant though, in exchange for loose change or, a token more appreciated, a box of matches. nice lomo shots. photos 1 and 3 are the ones that i like the most. i also like the smile of the woman carrying her child. it tells me to buy a lomo cam very soon. Another option would be to browse through vintage cameras in Hidalgo St., Quiapo- the Mecca for local photographers. thanks eazy. i appreciate that. i’ll check both eBay.ph and Hidalgo. I know Hidalgo but haven’t tried checking lomo cams there. that’s a very good idea. the dong: True lomographic cameras like the LC-A may be very hard to come by in Hidalgo. Although I came across a Lomo Lubitel 166B once. For these, visit lomomanila’s marketplace forum. At Hidalgo, you might want to watch out for rangefinders, particularly those of Russian make (eg. FEDs), or TLRs. The Russian cameras have good lenses but tend to be chunky… for more compact rangefinders check out the Japanese ones like Konica or Canon. the dong: by the way, if you are looking for a cheap alternative to the LC-A, try a Vivitar Ultra Wide & Slim (UWS) which retails through private sellers at lomomanila for P1,000-P1,500. It produces similar vignetting. I want to go here too!!.. Byahe pa Sagada ako sa sem break whooo at syempre sama Holga! @nenan: thank you very much. i’ll link up your backpacking blog as well. cheers. 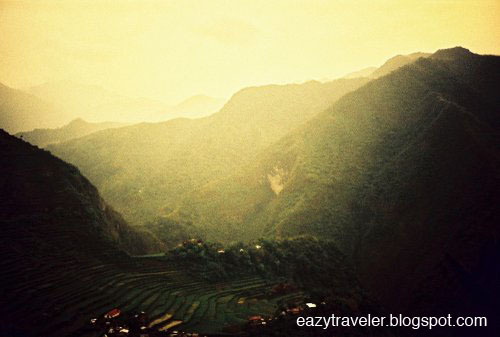 @UWO: Batad and Sagada are must-sees in the Cordillera Region. I wanna visit Sagada again during All Souls’ Day to experience the cold season and witness the bonfires at their cemetery. Lomo on! I would like to visit the rice terraces for the 1st time. Re. 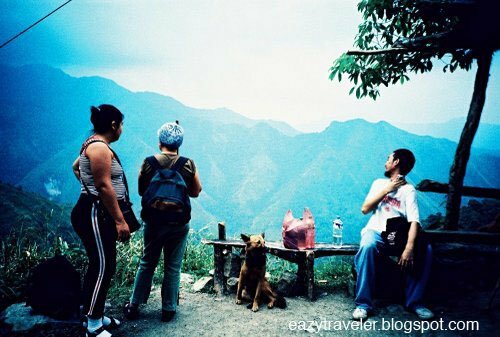 your Batad trip, you mention a 1 hour hike downhill. How hard is the return hike uphill? Can a older person (60+) do it? Hello Ismael! Actually the hike downhill can be quicker than an hour, and I think can be managed by elderly people, without heart condition or other serious ailments. Do note that professional medical assistance is not available in the village. The dirt pathway is very manageable because of the steady incline. It is very walkable, although rocky and slippery in some portions. Walking sticks are available for rent (or can be purchased for a perfect souvenir). This path is the only way into the village, so you will definitely cross paths with locals and fellow travelers who can guide you. There are small sheds along the way for you to take shelter, sit down, rest and take in the view. Souvenirs and (overpriced) beverages are also sold here. Upon reaching Sitio Chung Chung, you will be greeted by a tourist information center that can direct you to your guesthouse. For more local knowledge, I recommend you reach my contact person in Batad, Darwin Poligon. His mobile number is listed above. He is a farmer and tourist guide, who has taken me on a trek to nearby sights and neighboring settlements. His wife, Harriet, sells souvenirs at the ‘saddle’ and accompanied me to the village. Hope this helps. Thank you visiting my blog and posting your message. Happy new year, and enjoy your trip!